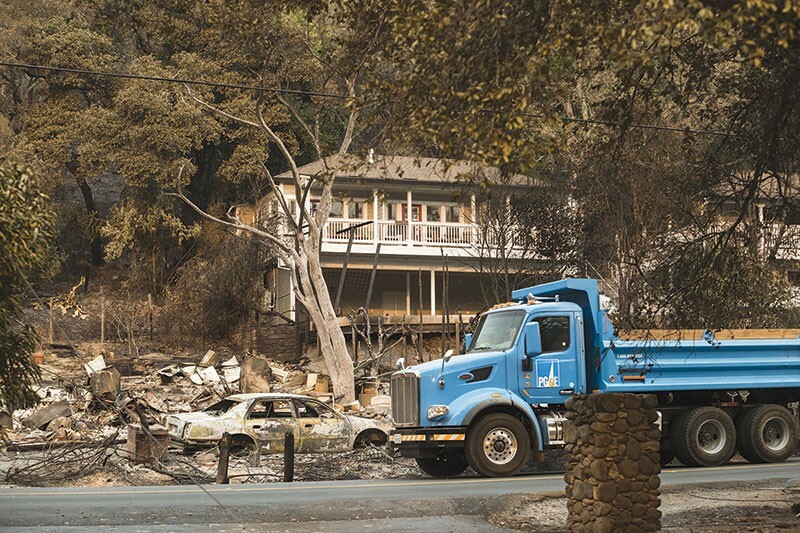 A proposed class action lawsuit brought by shareholders has been filed against the Pacific Gas & Electric Corporation (PG&E) in federal court. Suits were filed by PG&E shareholders John Paul Moretti and David C. Weston on June 12 in the United States District Court, Northern District of California, alleging violations of federal securities law by the utility. The law firms representing the plaintiffs note in their court filings from early June that there are potentially hundreds of thousands of shareholders in the proposed class-action suit. The two suits charge that between April 29, 2015, and June 8, 2018, PG&E executives engaged in what amounted to an ongoing pattern of deceptive statements concerning the utility's vegetation-removal policies. Those statements and the subsequent wildfires that tore through California last year are the fulcrum of the suit, as recent official investigations into last year's wildfires have identified the culprit in a number of fires: PG&E power lines coming into contact with tree limbs during a high-wind event last October. The class period dates back to April 29, 2015, because that's the day, charge lawyers for the plaintiffs, that then–PG&E CEO Christopher Johns, during a conference call with investors to discuss the company's performance during first quarter of fiscal year 2015, "assured investors of the company's commitment to step up vegetation-management activities to mitigate wildfire risk." Those assurances, the suit alleges, were made to shareholders for the next several years leading up to the 2017 fires—which, the suit argues, make a compelling case that the utility had not stepped up its efforts at managing vegetation. Johns is named in the suit along with company vice presidents Jason Wells, David Thomason and Dinyar Mistry; Geisha Williams, the current CEO and president of the utility, is also named in the suit. The defendants, charges the suit, by reason of their position as executive officers within the company, "possessed the power and authority to control the contents of PG&E's quarterly reports, press releases and presentations to securities analysts, money and portfolio managers, and institutional investors." The suit alleges that the executives "knew that the adverse facts specified herein had not been disclosed to and were being concealed from the public, and that the positive representations being made were then materially false and misleading." Along with the April 2015 reassurances about vegetation removal, the suit charges that the company's media-relations department maintains a website which "repeatedly touts the safety of its network and the company's proactivity in fighting wildfire risk." Those claims were also made in filings that the utility submitted to the Securities and Exchange Commission in 2016 and 2017, which stated that the utility had "upgraded several critical substations and reconductored a number of transmission lines to improve maintenance and system flexibility, reliability and safety." The events of October 2017 and subsequent inquiries by Cal Fire into the cause of the fires has rendered those statements "materially false and/or misleading" because they misrepresented and failed to disclose to investors that the utility hadn't maintained electrical lines under state law. The suit alleges violations of two sections of the Securities Exchange Act of 1934 and seeks a jury trial to determine the utility's culpability. The plaintiffs in the current suit, Moretti and Weston, both purchased shares in the investor-owned utility, the largest in the state of California, only to see shares in PG&E stock decline in value in the aftermath of the 2017 infernos that tore through the North Bay. Moretti purchased 280 shares of PG&E common stock between Oct. 12 and Oct. 13, 2017. On Oct. 12, he purchased 95 shares at $66.15 per share. By the next day, the shares were selling for between $57 and $58 a share, and Moretti purchased 195 additional shares. According to court records, Weston purchased 1,000 shares just a few days before the fires broke out, on Sept. 27, 2017. He paid $68.75 per share. Weston then sold 1,000 shares on Oct. 13 when they were trading at $57.96 per share. The plaintiffs are being represented by law firms in New York, Beverly Hills and San Francisco. At the time of the fires, which scorched some 250,000 acres in the Northern California, PG&E shares were trading at $69.15. By Oct. 16, they'd dropped to $53.43 and would continue to slide throughout 2018. By May of this year, shares were trading at $42.34. On June 8, PG&E shares were trading at $41.45 per share. Three days later, June 11, shares of PG&E common stock closed at $39.76. In December 2017, the company announced the suspension of a 2018 cash dividend for investors, and two weeks ago the utility said it would take a $2.5 billion charge this year in order to deal with mounting insurance and legal issues related to the fires that had driven down its common-stock value. PG&E has not admitted to any culpability in the fires. In public statements and media interviews, the company has repeatedly stressed that global warming has coaxed forth a "new normal" in California wildfires, and that at the time of the fires, it believed it was in compliance with its obligations to state law. As fire-related class action lawsuits mounted this year, and as Cal Fire investigations started to conclude that power lines coming into contact with tree limbs had been a predominant cause of the wildfires, the utility hired heavyweight Sacramento lobbying firm Platinum Advisors in May. The firm was founded by Sonoma County developer Darius Anderson. The precipitous devaluation of the common stocks in PG&E, to the plaintiffs, are a sign that executives at the utility "engaged in a scheme to deceive the market and a course of conduct that artificially inflated the company's stock price, and operated as a fraud or deceit on acquirers of the company's common stock." As of April of this year, the suit notes, PG&E had 516,427,502 shares of common stock, which are held by "thousands if not millions of individuals located throughout the country and possibly the world." In a statement, the utility did not directly address the substance of these latest, shareholder-led lawsuits as it highlighted its commitment to its customers. "Nothing is more important to us than the safety and well-being of our customers and communities we serve," says Paul Doherty, a San Francisco–based marketing and communications specialist with the utility. "Our thoughts are with everyone impacted by these devastating wildfires. We are aware that lawsuits have been filed. We're focused on doing everything we can to help these communities rebuild and recover."